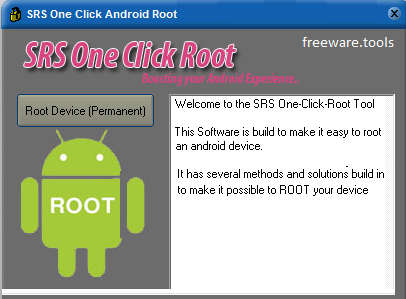 SRS Once Click Root is a lightweight, yet powerful program that enables you to root your Android device (phone or tablet) with just a click of the button, as well as unroot it. Install any app you'd like. Tethering is no more problem (turn your phone in an internet access point, think 4G). - Remove bloatware (the thing your provider pre-installs on your phone and you normally can't remove). Change APN settings. - Speed up your phone (by tweaking and overclocking). Run custom made firmwares . - Unlock your phone (rooting is almost always needed for sim unlock). Gaining full access to manage and control all the functions of a device is something most users would like to achieve, with the least amount of effort possible. This applies especially when it comes to mobile phones powered by Android. Unlocking such devices in order to gain administrative privileges and modify system settings or apps requires a specialized utility and one of the most sought after goes by the name of SRS One Click Root. The application comes with a really easy to use interface that will help you root your phone with just a single click on the dedicated button. With SRS One Click Root you can also revert this process, in an identical manner, no configuration needed. Since this program can do its job basically on its own, it is very important to prepare the device for this operation properly if you wish to succeed. Everything you need to know about the whole process is clearly presented in the main window of SRS One Click Root. Prior to using this tool to perform the rooting, you should bear in mind the fact that once you choose to walk down this road, you will almost certainly void the device's warranty. If you are aware of this and have made up your mind to set your Android phone or tablet free of any restrictions. Since there are no options to customize or any settings to meddle with, connecting the device to the PC and then pressing the “Root Device (Permanent)” button will start the process which carries on automatically. All things considered, if you need a simple software to help you get access to the root level of your Android device, SRS One Click Root should do the trick for you. Really easy to use, the application is bound to become one of the favorites in its category.